Yesterday was one of the best World Cup battles I have had. After a slow week in the countryside of upstate New York, staying in a farm house without the usual time occupiers of cell reception and internet I was looking forward to some race action and Action is what I got Saturday. After recovering from a mediocre start, I was able to grab the lead and pull away with only Julie Besset coming with me. It's always neat to have number 1 and 2 duking it out blow for blow for an entire race and there was an amazing Canadian and American crowd cheering the entire time. Even all the team managers were getting into it and every word of encouragement was appreciated! To have a hope at winning the World cup overall, I could really use another win. I was entering world cup #5 140 points behind, but a win would bring it down to 90. I also had set a goal of achieving back to back victories and winning the end of a race. Often in a head to head, I am the one settling for 2nd. Although I didn't win the race I still feel like I hit many of my goals. I raced strong two weekends in a row, I battled hard and felt strong and challenged Julie the entire race right up till the last hill sprint to lead the single track. Julie barely nipped me for it, but went on to put out very strong surges on the 2 single track climbs that were mixed into the descent. She opened a 7 second gap, but I wasn't giving up and with less than 2.5 minutes to the finish it was down to 5 seconds. I chased her hard and felt that the lower section of the descent was where I could hopefully make up some time. Then some misfortune struck. The spare tube attached under my seat unraveled and went into my rear wheel. I ended up losing around 30 seconds and any hope of closing on Julie. So in the end I did have to settle for second, but I feel good about my form and the knowledge I gained of what I need to improve in my riding to be able to win a head to head next time....not to mention I will always mount my spare tube on stem from now on! I also feel inspired by the challenge of earning another World Cup win. It was a good day all round for the Luna team with Georgia claiming 5th spot on the podium and Katerina finishing 7th. We also took the number 1 team position for the 3rd consecutive race. 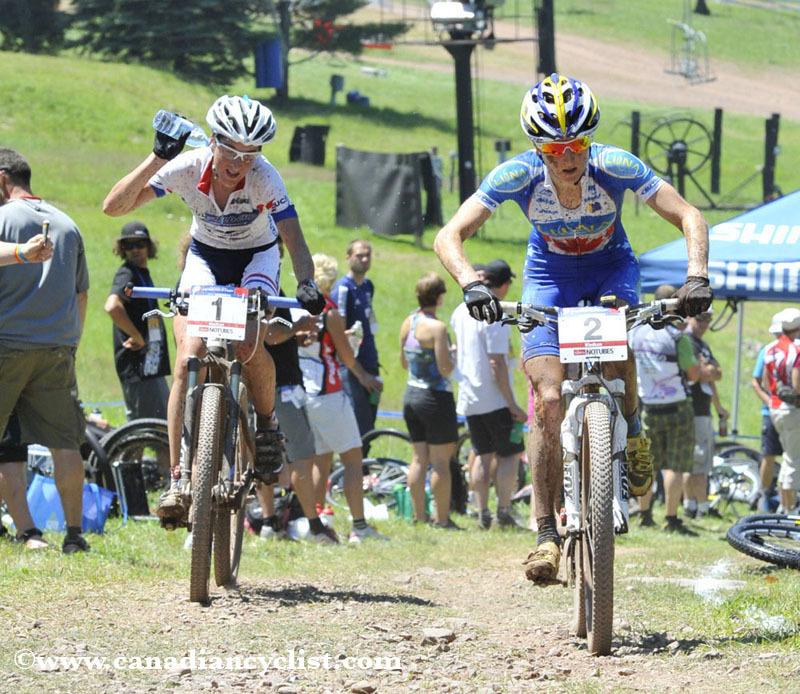 Canadians rode strong with Marie-Helene finishing 4th, Emily 18th and Amanda, the 3 amigos (jean-ann, Catherine, Sandra) and Mical between 30th and 40th. Thanks CP! I watched the race on the Internet and couldn't believe how hard you guys were hammering it! Incredibly exciting! Good luck with the Nationals!